Scott Graham’s ‘BullyFreeME’ anti-bullying assemblies and keynote presentations have been available for twenty-six years and have become the most successful anti-bullying programs for schools in Canada. Why? Because they deliver strategies that work. The presentations include usable anti-bullying strategies, and inspire leadership. A confident child can implement the anti-bullying strategies and motivate others. Please check out the bullyfreeME promo footage with testimonies from hockey great, Doug Gilmour and lead singer, Gord Deppe, of the band, the Spoons. Scott Graham has presented to schools in British Columbia, Quebec, Ontario, and Newfoundland. Scott has also worked with students in Perth and Edinburgh Scotland. Scott wants to help all children realize that they have the ability to be leaders. BullyFreeME presents an energetic and captivating anti-bullying curriculum, developed by author, producer and award-winning presenter Scott Graham. These anti-bullying resources are filled with fun and useful strategies for coping with bullying in schools — or outside of it! Assemblies run 45 to 60 minutes and are designed for grades 1 to 4 or 5 to 8. Presentations are also available for high school students and parents. These assemblies include valuable leadership lessons that will benefit the entire school community. Scott Graham is not just an entertainer. He’s been featured on Global News, CH News, and CFRB as a bullying expert. He holds a Certificate in Social Work and a B.A. in Social Development and has studied with the world’s number one expert on leadership, John C. Maxwell. 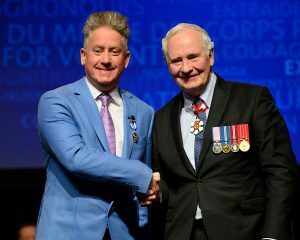 He was awarded the ‘Men Who Make A Difference’ Award by the Halton Women’s Place and received the Meritorious Service Medal from the Governor General of Canada. Scott Graham will make a positive impact on your students and your school culture. Check out Scott Graham’s “Life Fantastical” documentary and his TED talk. We offer leadership/anti-bullying and literacy presentations. See below for details. BULLYFREEME PRESENTATION: Scott Graham presents to primary, junior and intermediate students. Scott Graham explodes onto the stage, engaging students with real-life stories, usable strategies, and incredible insight. Students and staff will leave inspired and motivated to help themselves and others. Scott has been helping students with bullying for 26 years. LITERACY PRESENTATION: Scott Graham is an individual who struggled with reading and writing. Scott will inspire students with his story of dealing with ADHD and a learning disability. He will discuss how he came to realize that these labels were gifts, which would lead him to bestselling author status. Scott will instill the love of reading and writing into your students and inspire them to use their challenges to empower themselves. Do they have principals you can speak with about their work? bullyfreeME – yes, when requested. Do you want a program that is engaging or do you just want entertainment? There are presentations that are entertaining, but don’t leave your students with any usable anti-bullying strategies? The bullyfreeME presentations are engaging, energetic and proven to offer usable strategies. They inspire leadership. Leaving definitions aside, most of us can recognize bullying when we see it — but if you’re a kid, you may not know how to deal with it. Bullying can come in many shapes and forms. It can be physical bullying, like punches and kicks, or verbal bullying, like insults and put-downs. In today’s modern age, it may even take the form of cyberbullying — bullying that happens online, often through social media. Whatever the case, Scott Graham’s BullyFreeME anti-bullying assemblies can help children develop fun and useful strategies for dealing with bullies — wherever they appear! Bullying prevention begins at school. This is where most bullying takes place. Bullying can create an incredibly negative environment for learning and have a huge impact on your child’s physical, mental and emotional safety. If your school does not have an anti-bullying program in place, then it is important to start a conversation about the effects of bullying. Scott Graham’s “BullyFreeME” anti-bullying assembly is a great way to generate bullying awareness in your school. It works well in combination with new or ongoing anti-bullying programs, using its proven strategies to help kids say ‘No’ to bullies! See below for testimonials from principals, teachers, and students who have experienced these amazing presentations firsthand! Interested in learning more about our other presentations?